Set holiday priorities with your family. Discuss what traditions to keep, which to discard, and which new traditions to try. Make a holiday to-do list NOW and create a realistic schedule for when to accomplish each item. Avoid over scheduling. Ask family members for help with holiday tasks. Shop via catalog or Internet, and avoid stores on weekends. If you're shopping with small children, take along snacks, books, toys or other items to make waiting in line more pleasant. Or, if you're sufficiently uninhibited, sing a holiday song with your child. If you're shopping alone, use waiting time to relax and and center yourself with meditation or prayer. Try directing your attention to your breathing at your belly. Or practice observing the people around you through the eyes of compassion, without judging. Give thanks or pray for healing, peace, or other concerns close to your heart. Invest in yourself by using a therapist to help create a plan to protect your boundaries. Think “low key” for a happy celebration with little ones. Remember that your small child thrives on your undivided attention and has a limited capacity to adjust to adults' “needs” to hurry. Protect your child's nap time and play time. Spend “floor-time” with your child every day. Create family traditions that involve giving to those in need. 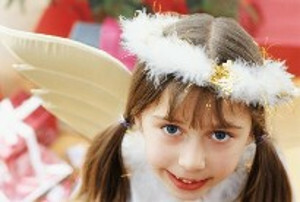 Focus on low-cost or no-cost holiday traditions. Help keep children's expectations realistic. If credit cards make overspending too easy, stick to cash for holiday purchases. If you have lost a loved one, the holidays may intensify your grief. If “holiday blues” persist or seem particularly intense, don't hesitate to reach out for professional help. Your physician or clergy person can give you a referral. Spread out the fun at least through the end of school vacation by planning an outing or a fun time at home for each day. A little forethought and planning can go a long way towards making you glad the holidays are coming - instead of just being glad when they're over. Your wisdom holds the key to holiday joy.